On International Transgender Day of Visibility, allies should be setting an example for others. Visibility is such a fraught concept. 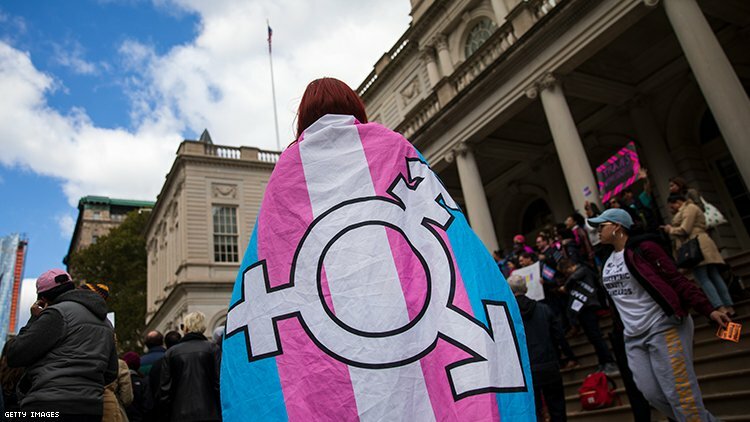 On one hand, it’s validating to be seen as a transgender person, especially if you’ve spent a considerable amount of time being ignored and erased. On the other hand, it can be jarring, inducing a raw vulnerability in which you become a testament of something greater, a marker of how far the world has (at many times, begrudgingly) transformed. Visibility doesn’t always leave you feeling powerful — in fact, it can make you a target. In those instances, it’s less about you and more about the people around you. I’ve been visible in my gender nonconformity for as long as I can remember. I’ve made a conscious effort to be authentic and vocal about my experience, but I never really felt like I had a choice. As soon as I was in grade school, my peers — usually boys — would excoriate my perceived femininity and queerness. Identifiers like “gay,” “sissy,” and “effeminate” were thrown around with reckless abandon. It wasn’t until college when I was able to find the words to more fully explain my identity, that I draped myself in “transgender” after a series of gender studies courses and reading books by trans women: Whipping Girl by Julia Serano and My Story by Caroline Cossey. By that point it wasn’t so much that I wanted to be seen by others, it was more about expressing all of those things I had to fight to see in myself: The beauty, the power, the confidence, the promise. And when you’re out as trans, you’re forced to make a constant commitment to explaining yourself or your perspective, to prove you’re right about who you are. The people who don’t support you typically make that known in some way. The ones who do support you often don’t want to see the moments of doubt, or when you’re overwhelmed… They want you to feel at home in the visibility because, after all, that was always your goal, right? But what if that visibility wasn’t wrapped up in that person who had long been ignored and erased? What if it was more concerned with the supporters who had only ever mustered a silent solidarity? What if on International Transgender Day of Visibility, non-trans people — in our families, communities, and workplaces — actually express their belief in ensuring we get to live and be exactly who we know ourselves to be? Long-time activist and Stonewall veteran, Miss Major Griffin-Gracy, shared some powerful, encouraging words along these lines in the lead up to TDOV. She reminds us that visibility is often what gets trans people killed. And going further, it can also be what gets our people criminalized, incarcerated, detained, and more marginalized. We have to envision a world beyond us just being seen. Despite the continuing struggles, our community is more powerful than ever and is creating so much on our own terms. We have numerous organizations dedicated to compiling and distributing the resources our people need; we have some platforms that center and elevate our voices; we have more and better representation in the media. We certainly need more of all of these things, but we’ve come a long way. And, if we’re talking numbers, we still need support from cisgender people. We can’t do this alone. How else do you think trans politicians (like Danica Roem, Andrea Jenkins, and Phillipe Cunnigham) were elected to office? How else have trans people taken on leadership in spaces that were once cis-led and/or cis-only? How else have some of our transcestors (like Sylvia Rivera and Marsha P. Johnson) made powerful contributions to the various movements in which they were a part of? So today, on International Transgender Day of Visibility, while trans people share our own commitment to ourselves and our journeys, if you’re not trans — share how you will commit to supporting us on a daily basis. How will you ensure that trans people are being hired and supported in your workplace? How will you ensure that trans people are welcomed and cherished in your place of worship? How will you ensure that trans people will be safe walking down the street? How will you ensure that the material realities of trans people — in housing, in healthcare, in education — are improved? You may not have all of the answers just yet, but a bit of power comes in simply trying to find them.